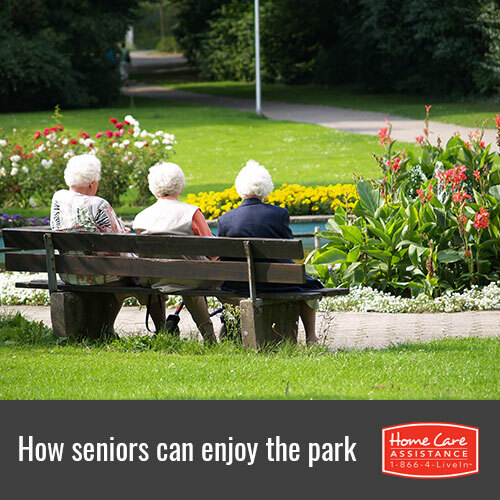 Seniors who want to get out of the house more often and participate in some fun activities can head to their local park. There are many stimulating ways to spend a day outside, and the staff at Home Care Assistance, a leading provider of at-home care in Harrisburg, suggests a few activities your elderly loved one can try. Tai chi not only increases balance, but it also reduces pain, diminishes stress, enhances circulation, and promotes inner peace. This ancient exercise can also alleviate symptoms of age-related disorders such as osteoporosis and osteoarthritis. Even if your loved one doesn’t know any tai chi movements, he or she can engage in gentle stretching exercises that work in similar ways. However, make sure your loved one is healthy enough to perform these exercises. Speak with your loved one’s health care provider if you’re not sure, and consider hiring a respite caregiver in Harrisburg to help your loved one stay physically active. Bird watching and identifying various bird species can be both relaxing and mentally stimulating. Your loved one can document his or her findings in a journal and add more findings during subsequent visits to the park. Bird watching not only helps pass the time while visiting the park, but it is also a hobby your loved one can participate in anytime he or she is outdoors. Elderly people sometimes lose their appetites because of preexisting medical conditions, medications, taste or smell disorders, and depression. Packing a picnic lunch with your loved one’s favorite foods may help stimulate his or her appetite. The combination of the fresh air, natural surroundings, and the presence of happy people can encourage your loved one to enjoy a healthy, nutritious picnic lunch at the park. Social isolation can sometimes affect a senior’s appetite as well, which can lead to dehydration, malnutrition, and weight loss. Taking your loved one out for regular picnics at the park may encourage a more positive outlook on life, increase his or her appetite, and enhance his or her nutritional status. Some seniors don’t get enough time outdoors because they need assistance and encouragement. If you’re concerned your loved one is spending too much time at home, reach out to Home Care Assistance. Our caregivers can provide transportation to and from the park, prepare healthy meals for a picnic, assist with exercise, and help with many other tasks. We also offer specialized Parkinson’s, post-stroke, and dementia care Harrisburg seniors can count on. For more information on our senior care services, call one of our friendly Care Managers at (717) 540-4663 to schedule a no-obligation consultation.